The Pool Store stocks just the right chemicals for your pool. If you’re not sure what you’re looking for, come on by and ask our team of experts and we’ll get you swimming safely. Algaecides add an extra layer of pool protection, while creating a more pleasant swimming environment. Regal algaecides safeguard your pool, preventing all types of algae. Properly balanced water will prevent corrosion and staining. It will also optimize the performance of your sanitizer. Regal simplifies this balancing act, giving you perfect pH, total alkalinity and calcium hardness for water comfort. The environment, swimmers and weather can introduce germs, algae and organic contaminants into your pool. To restore your pool’s luster, try Regal oxidizing agents. The key to maintaining a crystal clear pool is a steady routine of sanitization. Sanitizers kill bacteria, algae and other living organisms. They also help to protect water from the sun’s effects. Prevent specific water problems with Regal problem solvers. The perfect complement to your pool care regimen. 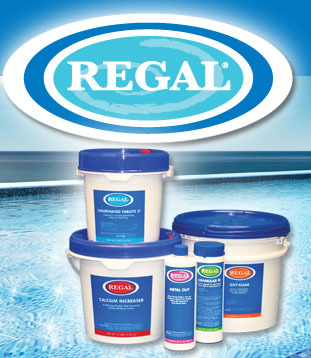 Regal offers a variety of cleaners, clarifiers and stain removers to solve specific problems. The Purple Stuff is a Salt Solution. The Purple Stuff is the stain preventative of choice, and a must product for salt pools. Unlike traditional sequestering agents, The Purple Stuff works extremely well in high salt and high TDS pools. The Purple Stuff keeps silica in solution while greatly reducing the incidence of cell fouling (scaling) in salt (chlorine) generators. The Blue Stuff does what The Pink Stuff does plus it’s proprietary blend actually removes copper from the water. The Blue Stuff is also very stable in higher chlorine levels and can be used in many fountain and water feature applications. Dosage: Initially, add one quart (32oz.) per 10,000 gallons of pool water then 6-8oz. per 10,000 gallons of water per week for maintenance. The Stain Solution #1 is the Iron, Cobalt, amp; Spot Etching Stuff. Stain Solution #1 is a non-acidic product for removing iron, cobalt, and spot etching stain from all types of pool surfaces without draining the pool. The Stain Solution #1 will normally remove these stains easily and effectively within 48 hours, with minimal re-balancing of other pool chemical products. Stain Solution #2 is the Copper amp; Scale Stuff. Stain Solution #2 is designed to safely and effectively remove copper stains and scale from all types of pool surfaces without draining the pool. In most cases, The Copper amp; Scale Stuff is more effective than acid washing the pool, and will save both time and money. Please Note: must bypass heater when using this product. 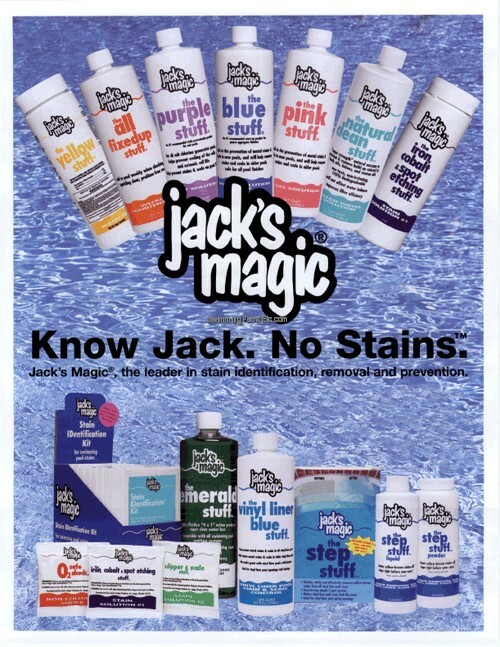 The Stain ID Kit is the first step in performing a successful Jack’s Magic stain removal. The Stain ID Kit is designed to take the guesswork out of removing swimming pool stains. One of the 4 simple topical tests will identify what bests removes a swimming pool stain, saving both time and money. Please Note: The water should be at least 65-70 degrees in order to insure accurate testing results. The 02 Safe shock is a non-chlorine shock (but not a persulfate compound). O2 Safe Shock yields more than 12% active oxygen (3 times more oxygen than persulfate compounds). O2 Safe Shock can be used as an acid wash pretreatment, making tough copper stains much easier to remove. Please Note: Not recommended for chlorinated pools, but ideal for biguanide, ozone, and ionization systems. The Vinyl Linear Blue Stuff is highly effective in all types of vinyl liner pools. The Vinyl Liner Blue Stuff has been developed to meet the specific needs of vinyl liner pools, including those with heaters. The Vinyl Liner Blue Stuff helps prevent metal stains (including copper) and scaling in new vinyl pools. This product also helps to remove metal stains and scale in older vinyl pools. 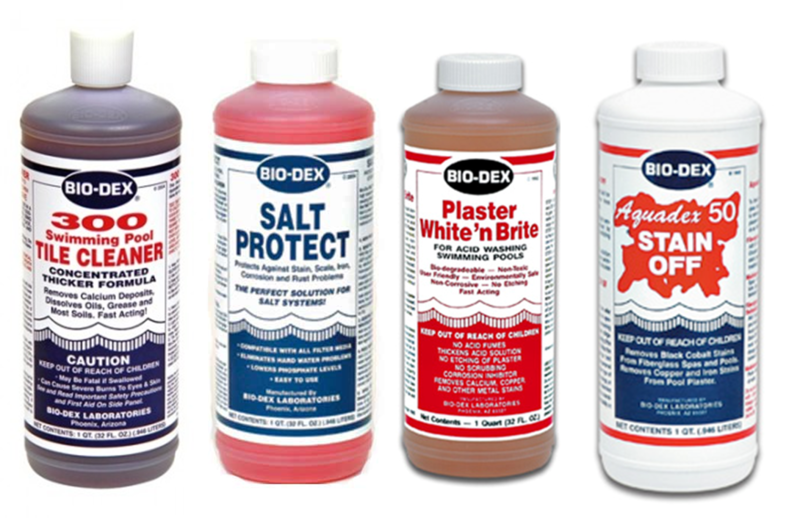 Protects against Stain, Scale, Iron, Corrosion and Rust problems in Salt Water pools. Removes black cobalt stains from fiberglass spas and swimming pools. No Mor Problems is a preventative algaecide that gives you a crystal clear pool. No Mor Problems prevents all types of algae and bacteria in every type of swimming pool. It’s patented formula works with your sanitizer to unleash its full potential- keeping algae from ever growing. 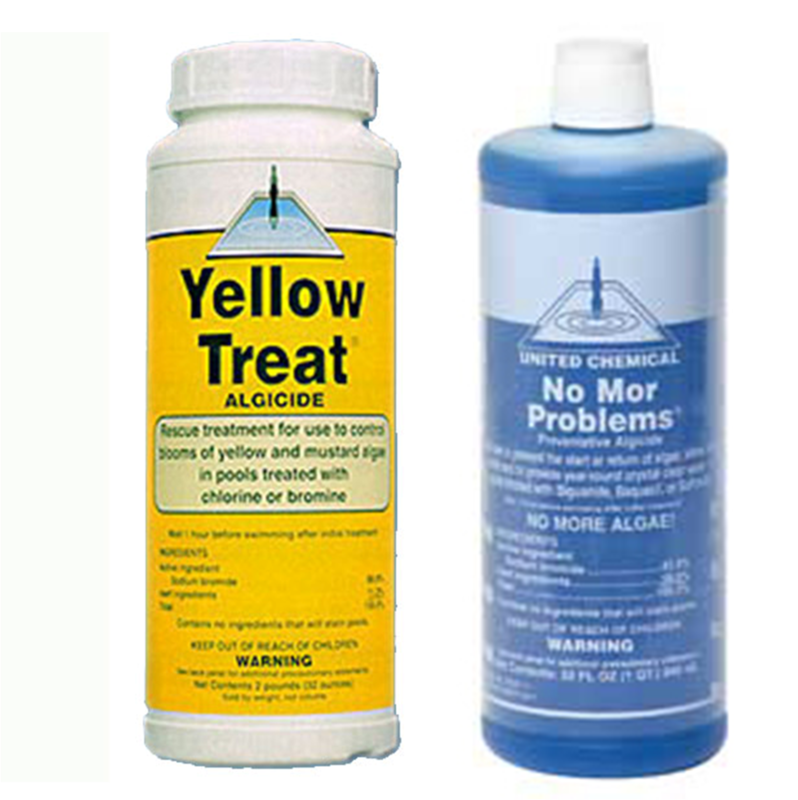 Yellow Treat is the most trusted Algaecide for killing Mustard and Yellow Pool Algae. Very easy to use just add one capful for 10,000 gallons of water and superchlorinate, and then watch the yellow and mustard algae problems disappear.